Caused by tears and inflammation in the plantar fascia, a band of shock absorbent ligament connecting the toes to the heel, plantar fasciitis causes heel pain that can range from mild to debilitating. A characteristic symptom of this condition is noticeable heel pain when taking the first steps in the morning or upon standing after sitting for an extended period. Pain is also typically worse after prolonged periods of standing or when shoes with inadequate support are worn. Rest. The first course of action recommended for alleviating the pain of plantar fasciitis is usually to rest. 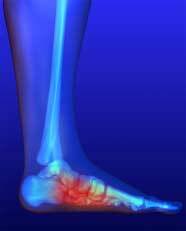 Removing weight from the affected foot or feet allows the inflammation to subside. Icing the area. Icing the area several times per day is known to alleviate plantar fasciitis pain for some. Physical therapy or stretching exercises. Specific stretches such as towel stretches can be done to relieve heel pain associated with plantar fasciitis. Your medical professional can provide information on stretches that are safe and effective for your situation. Weight management. Being overweight places excess strain on the plantar fascia and can contribute to plantar fasciitis, so weight management may be recommended as a part of a treatment regimen for plantar fasciitis. Orthotics. Wearing shoes with improper support is a common culprit for plantar fasciitis pain. Properly fitted orthotic insoles provide arch support and can help alleviate this pain. Anti-inflammatory medications. Non steroidal anti-inflammatory medications such as ibuprofen provide temporary relief for some dealing with the pain of plantar fasciitis. Night splints. Many plantar fasciitis sufferers experience relief from wearing night splints while they sleep. These specialized splints hold the foot in a position that prevents the plantar fascia from tightening during sleep. Early detection and treatment of plantar fasciitis can prevent its symptoms from worsening. If you experience undiagnosed heel pain, visiting a doctor sooner than later is advised. Because conditions other than plantar fasciitis can cause heel pain, a proper diagnosis is the first step to pain relief. About MMAR Medical Group: MMAR Medical Group Inc. is a supplier of orthopedic medical products including a wide selection of braces and supports. For quality cervical collars, a wide elbow brace selection and other quality braces, please visit www.mmarmedical.com.